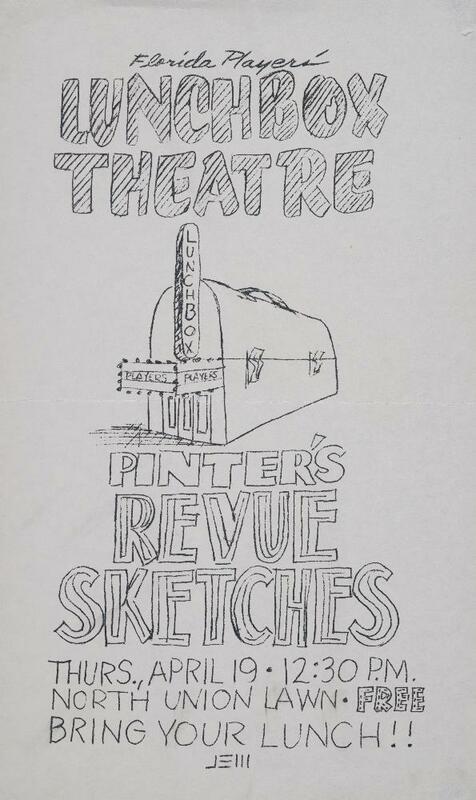 ﻿ Florida Players' Lunchbox Theatre poster announcing Pinter's Revue Sketches, Thursday, April 19. Florida Players' Lunchbox Theatre poster announcing Pinter's Revue Sketches, Thursday, April 19. An ad for the Lunchbox Theatre program on Thursday, April 19 at 12:30 P.M. on the North Union Lawn. Pinter's Revue Sketches was to be presented. A line drawing in the center depicts a theater in the shape of a metal lunchbox. "Bring Your Lunch!!"